If you would like to own this painting, please visit the Terms and Conditions. I had two Dads. My Father was a railroader, as was my Grandfather and both Uncles. An engineer, he drove trains, like the Super Chief, between Winslow and Seligman, in Arizona. He also drove the train from Williams to the Grand Canyon, both back when it was pulled by a steam locomotive, and later when it was diesel powered. Dad, my step-father, was a cat skinner; a bulldozer operator. Before, during and after World War II. Most of his career was spent in the forest, building roads for the logging trucks. He was an artist. An artist with a bulldozer. I swear, he could shave with the darn thing. I’ve seen grown men get damp eyed talking about the things he could do with that big yellow machine. Later in life, when the logging was coming to an end, he went to work in construction. He built stretches of Interstate 40 and Interstate 17. Which brings me to my point. I don’t like the Interstate. I avoid it every chance I get. Every time I think of my Dad working on the damn thing, I’m reminded of the young cat skinner in John Huston’sGrapes of Wrath, who bulldozes the Joads’ farm house because, “I have to feed my family, mister”. I don’t remember the exact dialog, and it may have been the neighbors’ farm, but you get the idea. I don’t know that the Interstate ruined any lives, but I do know that it killed a lot of small towns when it bypassed them in the interest of speed and so called progress. Then when the “well intentioned” reduced the speed limit to 55mph on the brand new, straight as an arrow in many places, and equally boring Interstate, A lot of people fell asleep, and, according to stats that I’ve seen, that new ribbon of road may, after all, have ruined, even taken a few lives. I don’t like the long distance trucks that eat up the road that was built, really, for them. I much prefer to see a long, long, double decker freight train, loaded with shipping containers and, yes, semi trailers, snaking its way across the desert. But I grew up on Route 66, from Ashfork to Albuquerque, and the vistas between towns are ingrained deep inside me. The landscape, the old, abandoned car bodies, most of them gone, now, rusted right down into the earth, the desert and mountains, and canyons. The clouds, and bands of horses, and lone cottonwood trees beside the washes. And the cars and the trucks, too. 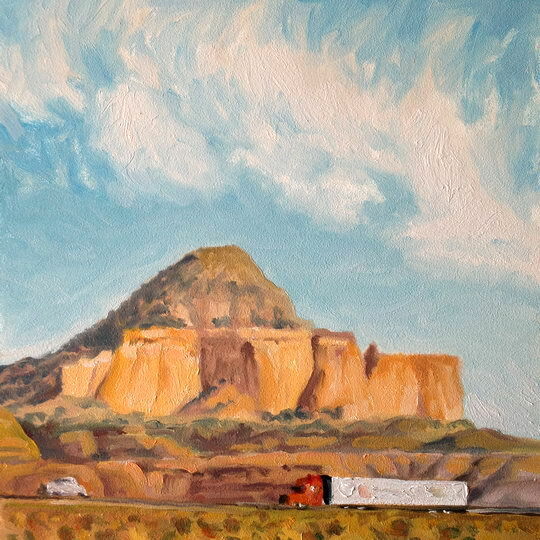 I have my disagreements with the trucks, but, visually, they are as important to me and as beautiful in my eyes as the deserts and mountains they go rushing through. I just like them better when they’re on the other side of the freeway. Don’t ask me how that little deuce coupe got into the picture. It started out as a modern sedan, but when it morphed into its present form, I thought I’d better leave well enough alone. It seemed to belong, like a ghost of one of those old rusting derelicts that used to dot the roadside. When Betsy broke down, I rented a car in Yucca Valley, and headed home to Taos. Various reasons, mainly a rush to get the rental car turned in before I got hit for an extra day, caused me to have to take the Interstate from Needles, California, all the way to Santa Fe. Blech. But views like the one above made up for it. Even on the Interstate, life is grand! Click on the image to really see it! Sometimes all you have to do is be there and be aware. And have an iPhone in your shirt pocket. 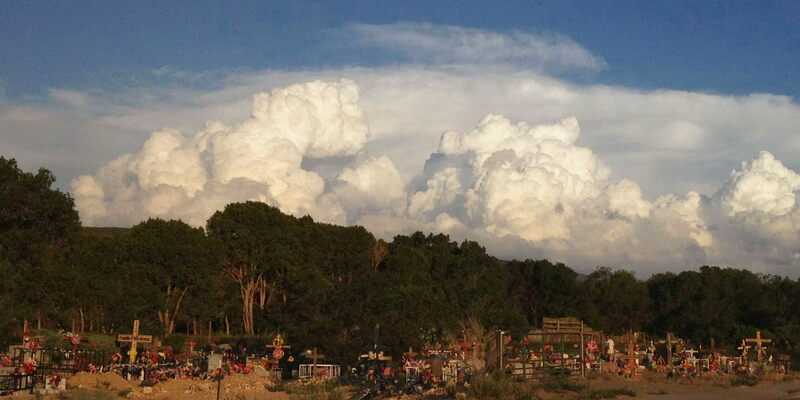 I had to run a quick errand just before dinner, and on the way home, I saw this great bank of building cumulus clouds. The only clear shot, I knew, would be across this cemetery near our home. I rushed there, pulled over to the curb, rolled down my window and shot. It is as shot, with a bit of cropping, and the levels adjusted slightly. Like they say, the best camera is the one you have with you. I SEE THE COUPE MORE THAN THE TRUCK. . .
It’s funny how I kept dabbing away at the little car. I was trying to make a generic modern sedan, it just wouldn’t cooperate. All of a sudden I made one vertical sort of s shape on the back and boom there was the little deuce. Darn near spooky. I treasure the biographical information you occasionally relate, John. Love it when you open up and write a lengthier blog post than usual too. The writing that accompanies your paintings and photos adds so much. Wow, it’s great knowing someone reads and even gets something from all this. Thanks for following along. definitely zeroed in on a good painting, post and oh my I love the photo too. You continue to amaze, even this gal that is with you all the time. Capturing the sene like you did made everything perfect. If you had waited even 5 minutes the clouds would have changed. The cemetery is beautiful. Hi Doris, glad you like it. You have a God Given Talent.